I can't spot a pixel different between the 18:30 and 19:00 (UTC) images. The contents of the files are different, though. Nope. I'm betting it will be the slow crumbling of the castle over several days (as others have predicted, I know). Calm before the storm. Something catastrophic is about to happen. Wait for it. *Sigh* Geekiness finally got the better of me, signed up just for this. I took the current frame and previous almost identical frame (I'm now opening image in new tab in my dedicated "Time" browser window so I can compare them quickly! ), put them on a couple of layers in Photoshop, set "difference" mode, then added a threshold layer to amplify the level (so even a small change sets a white pixel). Unfortunately I think I may be too new to post an image yet. But there's slight erosion here and there. Some barely visible. Oooh, oooh... time for the next update! Yup. I'll keep telling myself: "that was it, and it was a very interesting adventure, but now it's over"
morgothcr wrote: Yup. I'll keep telling myself: "that was it, and it was a very interesting adventure, but now it's over"
Even if it's the last image, who says it's 'over'? Might just be continuing out of the frame. Darkfusion wrote: Calm before the storm. Something catastrophic is about to happen. Wait for it. How long will the fandom keep speculating a deeper meaning, how many megabytes of information will we save on our systems, how many posts can we hit before we give up, how many times will our conversations repeat themselves, how long will we keep speculating a deeper meaning of the comic. It looks like it's starting to erode over the entrance. mscha wrote: I can't spot a pixel different between the 18:30 and 19:00 (UTC) images. The contents of the files are different, though. But seemingly no changes, unless Randall has changed the opacity of a pixel somewhere in the sky or something. In this one, she is depicted as the roommate and referred to using female pronouns. I did a pixel to pixel comparison and a single pixel went from RGB: (0x78, 0x78, 0x78) to (0x28, 0x28, 0x28). So one pixel got a little darker. My utility doesn't give me the coordinates, but it looks like it's on the right side of the image. A wave? Alt Text:"Mal, Simon, Wash, Zoe, River, Kaylee, Jayne, Inara, Book." I am pretty sure the gender of at least two of these is known. Also, http://www.xkcd.com/7/ is titled "Girl Sleeping...". Not a stick figure, though, so probably doesn't count. Last edited by Whizbang on Wed Mar 27, 2013 7:11 pm UTC, edited 1 time in total. Except it won't post because the forum thinks I'm spamming. I see all your comics in the 500's, and raise you to comic 340. Ha! So... I guess, this is it. So far, the scene was just setting up. Now we can watch the castle erode very, very, very slowly for days, weeks, months or even years. This is the real purpose of the Time. I still hope I'm wrong though. Last edited by NoMouse on Wed Mar 27, 2013 7:13 pm UTC, edited 1 time in total. Far right side, right where the water meets the black frame surrounding the panel. Oh dear God, what is Time doing to me? The only difference between 126 and 127 is a single pixel in the right hand corner where the sky meets the water. Perhaps BHG atop a pirate ship? The Water at the far right is one pixel higher in the new image. Last edited by Corrado on Wed Mar 27, 2013 7:15 pm UTC, edited 1 time in total. Me too. I'm usually late to the party on things, thought I'd join in and feel awkward. If not http://xkcd.com/524/ refers to her as her also. Maybe the erosion theory is true? Last edited by PinkShinyRose on Wed Mar 27, 2013 7:20 pm UTC, edited 1 time in total. There was some speculation about a loop and another regarding algorithmically eroding the castle. 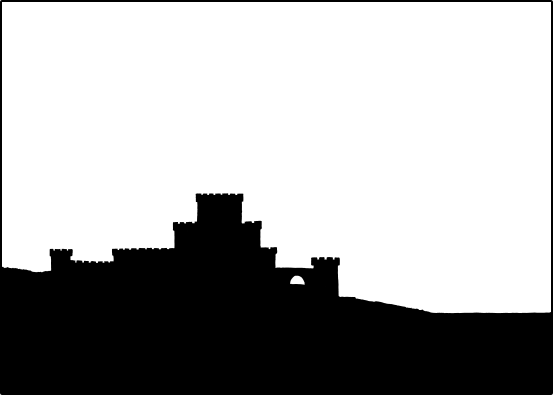 Suppose: the castle's algorithmic erosion (near some end point) is used as the basis for frame 1. Running said algorithm to some number of units of time determined to yield a specific duration of frames would give you an end point for the number of frames. Then you draw pretty comics all the way back to your starting castle and snipe the internets. Query: how long is this comic and would it be better to deduce its length intuitively (perhaps an anniversary?) or could a mathematical assessment of the frames be done at some point when enough frames had accumulated to derive meaningful statistics? Been lurking since Monday... finally I have a post to make. I took 125, subtracted it from 126, and saved the resulting file so that you could see the differences, saturating instead of wrapping around 0 so that places where 125 was slightly brighter than 126 didn't show up as bright spots. I then did the same in reverse, subtracting 126 from 125 to catch those changes. And find that they were just an MD5 Hash or an SHA1 hash of something like time001, time002 etc. or something like that, then we could write a simple script that could find the Md5/sha1/whatever of all the different pictures, then we could grab each and every one of them and put them into a gif. Alas, not that simple. Did anyone put their mind to grabbing each update? Yea, I found it too. The farthest pixel to the right that isn't black got darker. It's most likely a wave or an approaching boat. It didn't get higher... one pixel just got darker.